I got you there, I too didn’t know there were n and m dashes “–” and “—”. 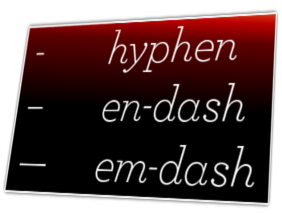 Tired of this repetitive process, I decided to replace n/m dashe with hyphen (-), those looked unfamiliar and rather creepy ( -example-), so I changed my mind again and decided to use double hyphens (- -). Well, it’s not that simple, so for those of you who really want to know the origin of things, check the wptexturize() function, specially around thoses lines. Name the file as you want but make sure you place it under the wp-content/plugins directory and you enable the plugin in your awesome website dashboard.